The long answer: keep reading! Of course, most homeowners know that they don’t need to use air ducts in order to cool their homes with their air conditioners. They can just lug those inconvenient window units out of the basement, install them in the windows, cool their homes during the summer, uninstall the behemoths, and return them to storage. Really convenient, right? By this point, you’ve probably picked up on our tone here. Skip the window units. And, for that matter, the air ducts! How? 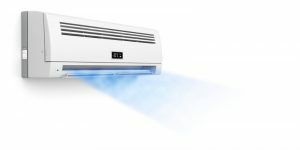 By using a ductless mini split air conditioning system to cool your home. Just remember that, like any other whole-house cooling system, you’ll need routine HVAC maintenance in Colorado Springs, CO if you want to use your ductless mini split as effectively, reliably, and efficiently as possible. Schedule your ductless tune-ups, installation, and repairs with the pros on our team. And now, let’s take a better look at how ductless systems work. Or, at least, it can be a heat pump. What’s a heat pump. We are glad that you asked! Okay, so a heat pump is, essentially, an air conditioner that is able to reverse its operation. In the summer it evaporates refrigerant in the indoor unit, which allows it to draw heat out of the air in the house. In the winter, the heat pump reverses its refrigerant flow and the function of its coils. Then, the heat pump evaporates refrigerant in the outdoor unit, absorbing heat from the air outside. The refrigerant is compressed to boost its thermal energy, and that energy is used to heat the air inside. This is a very efficient way in which to heat one’s home, which is why most homeowners, after deciding to go ductless, choose to use heat pump models rather than cooling-only ones. But that’s not the only great benefit of the ductless mini split. Ductless mini splits use multiple wall-mounted blowers in order to distribute conditioned air throughout the house. Each is controlled by its own individual thermostat. This is a great way in which to save energy, as you can custom-tailor your heating and cooling experience in different areas of your home. Plus, you don’t have to worry about duct leaks that negatively affect both indoor air quality and energy efficiency. Because of this unique design, ductless mini splits are ideal for those homes without preexisting ductwork, as well as for remodeling projects, or even just for homeowners interested in boosting comfort and efficiency levels at the same time! Remember, though, that this convenient design does not equate to a simple installation. You definitely still need to know that a trained professional is handling your ductless mini split installation. Work with us to ensure that this is the case. Schedule your ductless mini split services with Robbins Heating & Air Conditioning.